CQUniversity has been having conversations with stakeholders, internal and external, about the future role of CQUniversity in meeting the educational needs of Central Queenslanders and the organisations that employ them. As you know, we are very active in the ‘enabling’ space, as well as Outreach (we announced this week an expanded program to increase access and participation among low SES locals) and Pathways (specific programs to facilitate seamless and successful career pathways in mining and engineering) --- all of which are designed to break down barriers and make the transition to higher education as seamless as possible. The same could be said for the numerous articulation agreements and partnerships that we have with other education providers. Some people in the community feel, as do I, that there’s scope for the University to become better integrated with the community and more active and accessible in terms of the growing training and vocational education needs of Central Queensland. With the Queensland Government’s Community Cabinet, in Emu Park and Rockhampton, yesterday and today, we will have had meetings with the Premier, Treasurer, the Ministers for Education and Trade as well as representatives from Health and Natural Resources portfolios. I’ll be talking to them about a dual VET/Higher Education role CQUniversity could have in Central Queensland, as well as our plans to build Research and Learning & Teaching capacity at each of our regional campuses, and the investments we’re making in our new medical sciences, engineering, and law programs and facilities. Lots of talk was in the air leading up to the federal budget announcement. And whilst there hasn’t been an injection of funding into Universities, there have been resources freed-up for investment in training and skilling Australians, which is pleasing to see. Central Queensland, especially, should benefit from this as new and existing natural resources projects appear to be picking-up again. CQUniversity, I expect, will benefit as well from some Health funding which will allow for more clinical placements for allied health professionals. That’s good news for us and other Central Queenslanders, as CQUniversity will deliver Medical Imaging and other medical science programs to approximately 150 new students starting Term 1 2011 in Mackay and elsewhere. Long-term, the government’s investment in skills development (39,000 training places co-funded with industry) and foundation studies (language, literacy and numeracy programs) means more Central Queenslanders will acquire more skills and knowledge and have increased opportunity to advance their careers and fulfil their aspirations here in Central Queensland. And no doubt, CQUniversity will play in role in their lives. Already we work in that ‘development’ sphere with outreach and enabling programs (like STEPS), Pathways programs and close links with industry, which makes CQUniversity more accessible to Central Queenslanders. Next Tuesday, 25 May, we’ll launch – with Ian Kimber, Executive Director, Queensland’s Office of Higher education – a new and expanded CQUniversity Experience Outreach Program, (assisted by $1.5m from DEEWRs Higher Education Participation and Partnerships Program) which will increase the number of school leavers and others – especially students who are Indigenous, who come from a low-SES background, or who have a disability – benefiting from CQUniversity’s programs and services. These are areas – inclusion and access – where the sector looks to CQUniversity; where other universities and providers learn from our good practice. When the Deputy Prime Minister and Minster for Education, Julia Gillard MP, and I met on Tuesday this week in Mackay (for the opening of our new $8m Technology and Information Resources Centre) she spoke about the positive difference CQUniversity was making in Mackay in terms of partnerships and collaborations that drew community, industry and University much closer together. 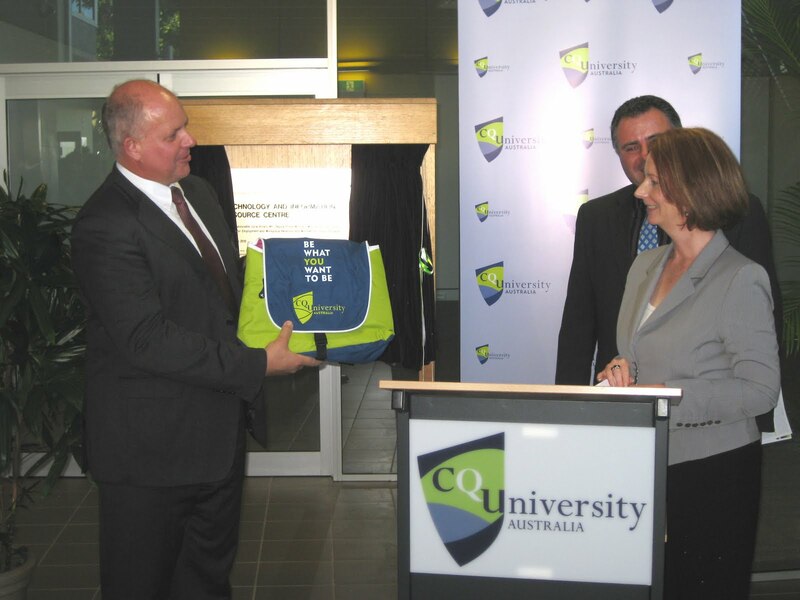 Here’s a picture from Tuesday… I handed Ms Gillard one of our bags emblazoned with the edict “Be What You Want to Be.” It happened to be a day after speculation was raised in the media about Labor party leadership…. The Minister quickly responded with a comment about attaining her dream position as full-forward for the Western Bulldogs AFL team…. It was good to have the Minister visit the University and I am pleased to see such involvement by the Queensland Office of Higher Education in what we’re doing…. There’s certainly a growing understanding and valuing of CQUniversity’s contributions to the sustainability, indeed vibrancy, of Central Queensland. And word is spreading too… Over the last few months we’ve attracted scores of academics from North America, Europe, Africa, Asia and across Australia to lead and contribute the University’s developments in the fields of Medical Science, Psychology, Social Work, Engineering and more. In addition, the University is investing $40m over the next two years to build new Engineering labs, renovate the Library at Rockhampton, install new medical equipment and build new student accommodations in Mackay. Last time I logged-in and blogged I said that change would ramp up over the next few months. Please stay in touch and sorry, again, for the blog lag. I’ll be back next week.